The Houston Cougar Men's and Women's Track & Field teams return home to host the Houston Alumni Invitational on April 6 at Tom Tellez Track. 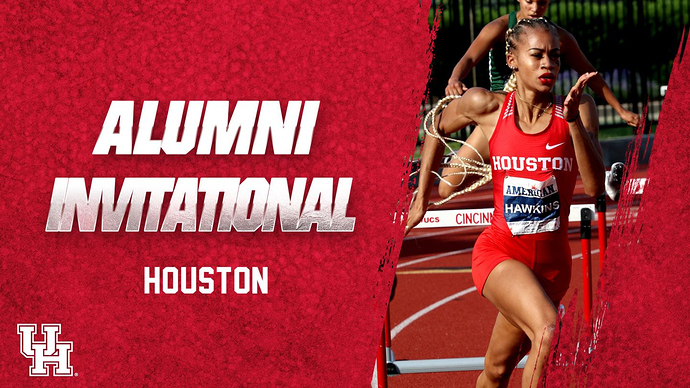 The Houston Alumni Invitational is Houston’s second of three home meets and kicks off Saturday at 10 a.m., with the men’s hammer throw, while running events will start with the women’s and men’s 3,000-meter run beginning at 12:45 p.m. The meet will wrap up with the men’s 4x400-meter relay starting at 4:25 p.m.
Live results for the Houston Alumni Invitational will be available courtesy of Flash Results Texas and can be found by clicking HERE. Travis Collins will be competing in the 100-meter dash as he sits in sixth in The American Athletic Conference this season with a time of 10.61. Ranked No. 14 in the USTFCCCA rankings, Mario Burke will compete in the 100, as well No. 18 John Lewis III. Jermaine Holt is sitting in sixth in the conference in the 200-meter dash this season with a time of 21.12. Holt will also be competing in 400-meter dash as he ranks on top in the conference this season with a time of 46.55. Kahmari Montgomery, who ranks No. 21 in the USTFCCCA rankings will take to the track in the 200 as well as Frederick Lewis, who ranks seventh in The American this season with a time of 21.20. Montgomery, ranked No. 6 in the USTFCCCA rankings in the 400-meter dash is slated to make his single-lap debut on Saturday as well and will be joined by Jermaine Holt, Lewis and Tyrell Valentine, who rank 1-2-4 in The American this season. Quivell Jordan will be competing in the 110-meter hurdles as he ranks third in the conference this season with a time of 14.39. Colin George and Brendon Rivera will be competing in high jump as they rank second and fourth, respectively, in The American this season with heights of 6-9.75 (2.08m) and 6-8.25 (2.04m). Ben Percefull will be competing in pole vault as he ranks third in the conference with a height of 16-6.75 (4.90m). The American’s top-ranked athlete in the shot put this season, Felipe Valencia will be competing Saturday as he has a top throw of 59-11.25 (18.27m). Valencia will also be competing in the hammer throw as he ranks eighth in The American with a throw of 168-4 (51.32m). Competing in the discus throw is Kenneth Sessums as he ranks sixth in the conference with a throw of 156-10 (47.80m). Each of Houston’s four men’s 4x400-meter relays will be a team to watch as Houston is known for our prestigious relay squads. Ashley Seymour is an athlete to watch in the 200-meter dash as she ranks eighth in The American this season with a time of 23.99. Birexus Hawkins is sitting at third place in the 400-meter dash in The American this season with a time of 54.58. Naomi Taylor is a definite contender as she owns the nation’s lead in the 100-meter hurdles with a time of 12.84. The women’s 4x100-meter relay team of Taylor, Ariele Adams, Essance Sample and Seymour sits in second place in the conference with a time of 44.77. The women’s 4x400-meter relay team of Hawkins, Seymour, Erin Derrow and Payge Side currently is in fourth in the conference with a time of 3:43.18. Hailey Pollard ranks fourth in the discus in the conference with a throw of 158-2 (48.21m). Weather permitting, I’m taking my kids out there today after lunch to watch a few of the events. 2 PRs at my redshirt season opener! 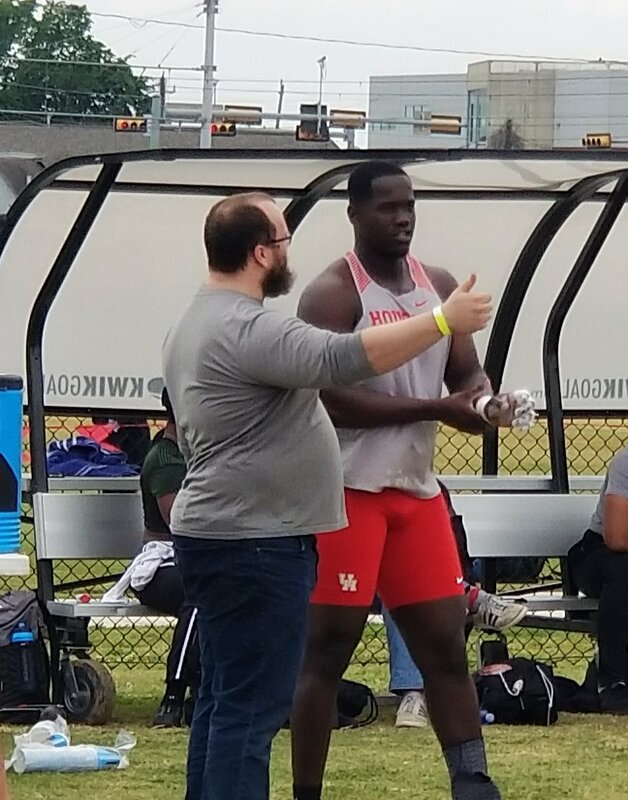 @UHCougarTF We got better today. There were some real world-class athletes out there today, and not just on the UH team.